Explanation: What created these huge explosion remnants? Speculation has been building recently that outbursts even more powerful than well-known supernovae might occur. Dubbed hypernovae, these explosions might result from high-mass stars and liberate perhaps ten times more energy than conventional supernovae. A hypernova was originally postulated to explain the great amount of energy seemingly liberated in a gamma-ray burst. A search for visible remnants of hypernovae has now yielded the above two candidates. 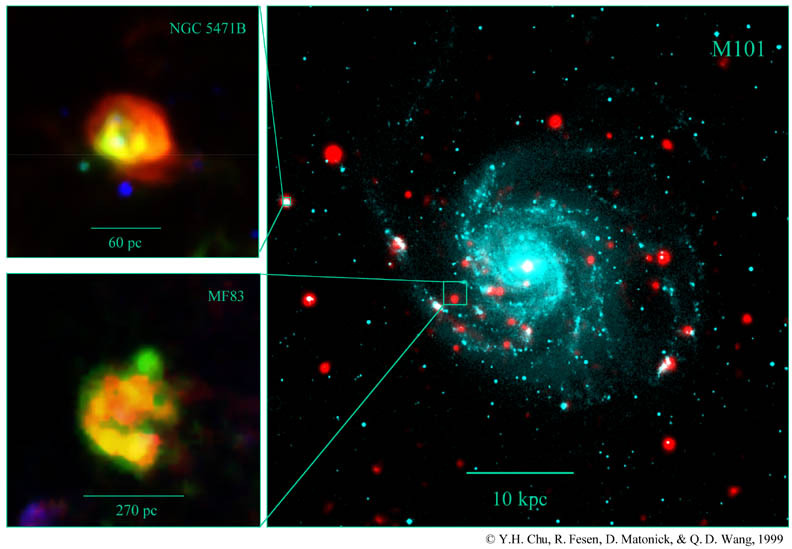 Nearby spiral galaxy M101, shown on the right, has two large expanding shells that might have originated from a hypernova. 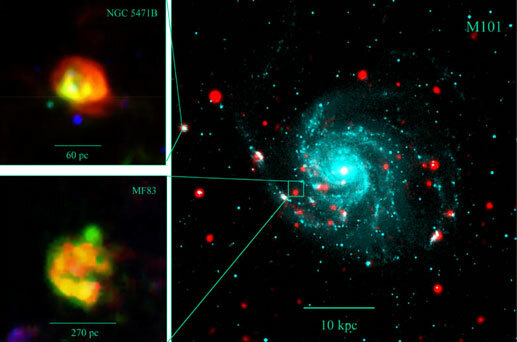 Remnant NGC 5471B on the upper left and MF83 below were identified by the unusually high amount of X-ray radiation they emit. MF83 is also one of the largest expanding shells ever found. Research continues into the possible nature and visibility of hypernovae and the gas shells they likely leave behind.